Harry Monaghan is glad to be back after a troublesome knee injury. HARRY Monaghan is back and raring to go after finally shaking off a troublesome knee injury. And with a double header of games over the next 72 hours he believes it’s the perfect opportunity to win back his place in the Derry City midfield. I would hope to get some game time over the next few days. I was playing well before my injury happened. As everyone knows it’s my full intention to get back into the team. The Scot was in fine form at the start of his first season at Brandywell prior to picking up an untimely injury to his medial ligament in the first half of the 1-1 draw in Longford back in April. He admits he rushed himself back too soon as he played 45 minutes in the 5-0 loss to Dundalk at Brandywell at the beginning of July before suffering a second set-back. However, after getting the all clear by the Brandywell medical staff, he claims he’s fighting fit and is hopeful of featuring in games against Sligo Rovers tonight and the EA Sports Cup semi-final against Limerick on Monday evening. “It’s been stop-start of me lately,” he said. “I’ve been back and then out, and then back in again. I think now we’ve got to the bottom of it and we’re good to go,” he smiled. “I probably did rush back a bit,” he admitted. “I passed a fitness test before the Wexford game and then Dundalk was the next game. “After that I put the reins on and seen a specialist and now, hopefully, it’s 100 per cent. “I expect to be back in contention for Friday night against Sligo,” he added. “I got some minutes last week and it’s just good to get on the pitch again. There’s no reserves games at the minute so it’s difficult to get minutes. Monaghan is delighted with his first season on Foyleside and is anxious to play his part as Derry attempt to progress to the EA Sports Cup Final. Although he understands he faces tough competition for places in the middle of the park with Conor McCormack, Aaron McEneff and Barry McNamee all playing superbly of late. 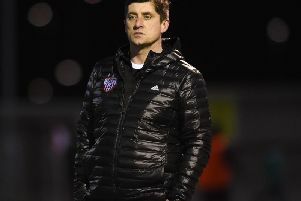 However, Monaghan is fully aware of the threat Sligo will pose tonight after the Bit O’Red secured a 2-0 win over Derry in their last meeting at Brandywell. With Monaghan returning to full fitness, Gareth McGlynn is the only member of the Derry first team squad still receiving treatment. Although Aaron Barry has made a late appearance in the treatment room. Monaghan is hoping physio, Michael Hegarty doesn’t have too much work to do from now until the end of the season as City eye a strong finish to the campaign. “We’re still waiting on Gareth McGlynn getting back but apart from him the injury room is pretty empty now which is a bit of a surprise. “It’s great to get most of the squad back and we have great strength in depth with everyone pushing for places. “We’re still in the two cups and we’re sitting third place in the league so everything is good now. “It’s important we maintain our focus and discipline we’ve shown all season. “We don’t want to get complacent and I’m sure we won’t!.” he concluded.